When you think of Grey Goose vodka it conjures up a great corporate luxury brand of vodka, but rarely does it make you think of a handcrafted farm sourced product. 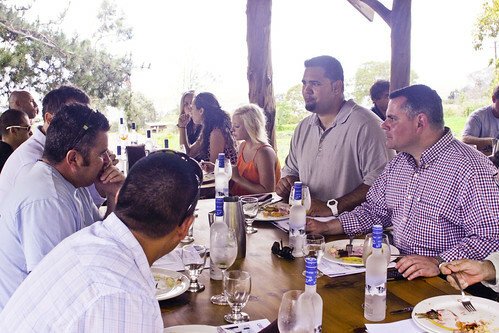 Yet I learned that is the starting point of its luxury recently at O’o Farms where Brand Master Aaron Rodonis explained Grey Goose nuances to a group of Maui chefs and bartenders. 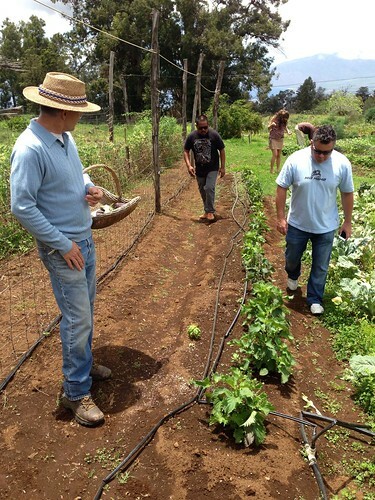 If you haven’t been to O’o Farms yet, you are officially on their invite list, give them a call at 808.667.4341 to nail down your tour to feast and forage. 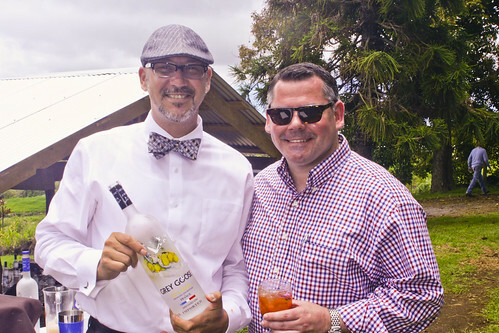 The eight plus acre farm served as the nesting ground to get to know Grey Goose better over crop created cocktails by Joey Gottesman, mixologist for Young’s Market. The farm is completely equipped for lingering over drinks and food, there is an amazing outdoor kitchen and wood burning oven, and community table dining area. Under this alcove Gottesman served the first sip worthy concoction, a vodka sour more or less, with a sprig of rosemary sort of stabbed through. Fresh lime slightly sweetened, frothed with egg white and a herb sprig. The resulting cocktail was aromatic and refreshing. Rodonis explained that Grey Goose is going to be doing a series of farm to glass inspired events through the nation, starting with Maui. Kelii Heen, the new Young’s Market regional director for Maui coordinated the event not just to expose Grey Goose’s handcrafted side, but also to start a conversation about cocktails on Maui. “I would like to bring the bartenders and chefs here today to not only enjoy great farm experience that we can bring to our products and cocktails, but to also start a discussion about great drinks and what we do.” says Heen. 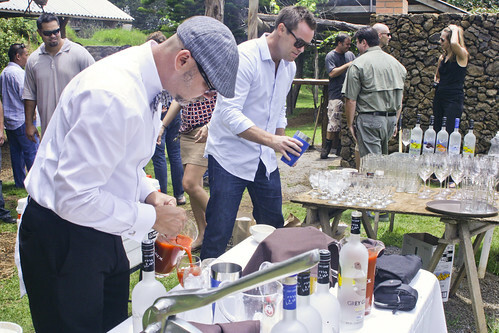 It’s Heen’s vision to create a community of bartenders, with events like these, that will show each other different sides of the industry, and inspire innovations, Maui born creations, and camaraderie. Something he has experienced on Oahu and Big Island and would like to see flourish here on Maui. Richard Clark runs O’o farms and took us on a brief tour to check out the crops and see some of the fresh produce that inspired Gottesman and Rodonis. 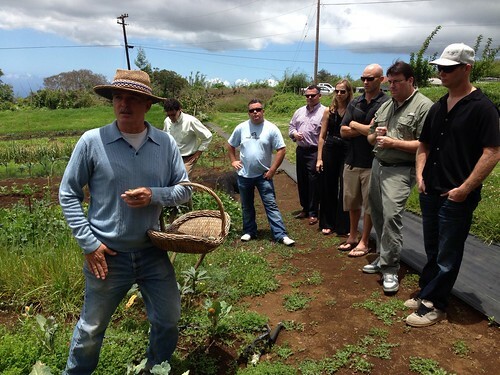 O’o farms was started by the owners of Pacific’o and I’o specifically to grow ingredients for their restaurants use, and remains one of the only proprietary farms on the island. By that he means what he does now on the land will affect generations to come, his operation is biodynamic and organic. 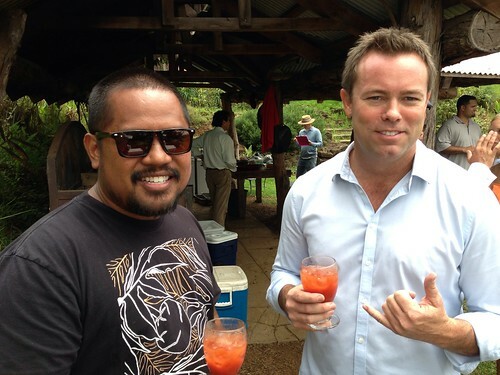 Chef Sheldon Simeon, formally of Star Noodle and Leoda’s, and Chef Isaac Bancaco of Pineapple Grill, with bartenders Freddie Scofienza of Westin Maui and James Shoemaker of Moana Cafe were among those in attendance soaking up the Kula sunshine and sampling herbs and grog. We compared crop notes and bit into exotic leaves as Rodonis explained the same methodologies were important in Grey Goose production as well while standing in among fresh garlic chive blossoms picked for garnishes in the cocktails. Gottesman’s bloody mary cocktail was dressed up with pickled farm beets by O’o farm’s Chef Anton, fresh pressed tomato juice, beautiful purple garlic chive flowers, smoked salt and pepper rim. It was a welcome revival after the warm walk on the farm. The chefs and bartenders mingled together in shop talk as we watched Chef Anton put the final touches on his midday feast of roasted pork, fresh flatbreads, parmesan polenta and roasted root veggies. The final cocktail was a simple citrus concoction not far from a spiked lemonade, with a balsamic reduction glaze inside the glass that added dimension to the flavor. 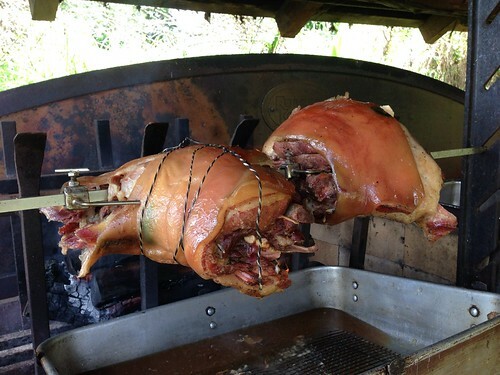 Simple yet invigorating with the rich pork. It couldn’t have been a more beautiful location with amazing weather and the great views offered by Waipoli Road. The basic sour will be two parts liquor, one part lemon (or sour stuff), one part sugar (or sweet stuff). Adding an egg white is optional but it is going to give your drink a creamy mouthfeel and it will be more substantial and have more froth. You can experiment with how much egg white to add too, its not necessary to have the whole egg white of one egg, you can play around with the ration. The rosemary is a very woodsy herb, you will want to strain bits out of the finished drink. Put all ingredients in the shaker with ice and shake well. Strain into a glass, add the garnish.